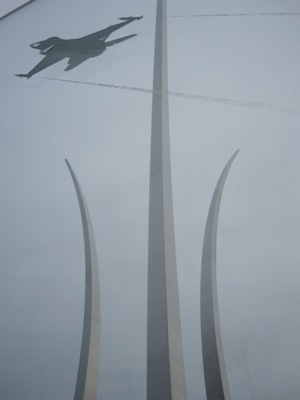 The listed coordinates will bring you to the most prominent feature of the Air Force Memorial - the three spires. The three stainless steel spires soar skyward, the tallest reaching a height of 270 feet. The three spires evoke the image of the precision “bomb burst” maneuver performed by the Thunderbirds. The three spires also represent the three core values of the Air Force - integrity first, service before self, and excellence in all that is done - and the Air Force’s total force - active, guard and reserve. Somewhere on the grounds of the Memorial is a quote by General "Tooey". In order to claim a find, e-mail me with this general's full name (as given at the Memorial) and the text of his quote. 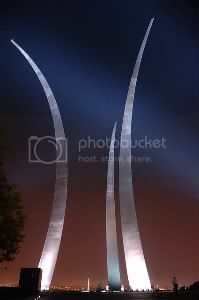 Check http://www.airforcememorial.org/memorial/location.asp for hours and directions. When this cache was created the hours were 8 a.m. – 11 p.m. April 1 – September 30 and 8 a.m. – 9 p.m. October 1 – March 31. There is a posted guard and I would not suggest attempting this cache outside of operating hours. 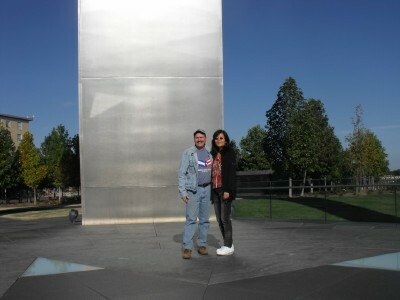 Sad, but I hadn't been to DC since about 1988, and I had no idea this Memorial existed. It is an awesome site though, and what a great view of the City, as I approached from the South with two high school kids who had not been to DC before the day of our visit. I always felt sort of a connection to The Air Force, being a 22 year Army vet, and we used to be the same branch until the Korean War, you know. Just an excellent memorial, much more impressive in person than I was expecting. Oh, stumbled on the required information in just about the last place I looked! Thanks for the Virt. Not exactly the greatest pic, sorry. Have been here before. One of my favorite memorials to see when driving on 395. Dropped by again to get the answer. 2422. My third OCUS cache today and my third visit to the AF Memorial. I always enjoy the site, though. Thanks for giving me another excuse to stop by. 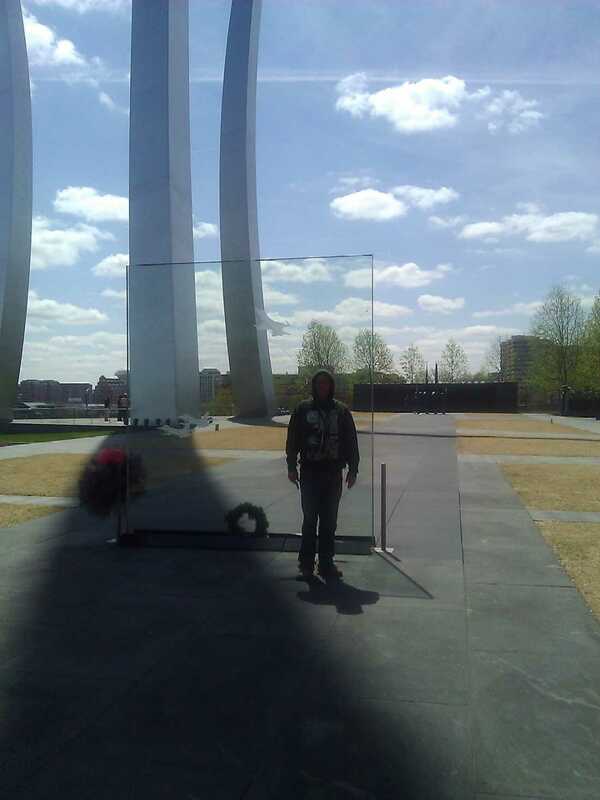 I have been to this Memorial several times. It's quite a sight to stand in the middle of the spires and look up. Mrs. sfcchaz enjoyed it very much as well, being her first time here (Awesome; as she put it) . Thanks for brining me back. Email on the way. I'm glad I checked before coming in at 6:15 in the morning. :-) I mananged to get out of the office for a quick trip over to the memorial later on and after searching around a little bit, finally found the appropriate quote. With a virtual, it's hard to say "First to Find" but I found it approximately 10:35 am, 9/29/10. I went to this memorial previously for a different Geocache, and it's still breath-taking to view. I remember watching it being built, seeing the pillars go up. What a sight!